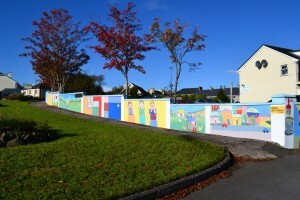 In May 2012 Swinford Tidy Towns Committee applied to the Dulux Lets Colour Project for our “Dulux lets colour project” at Mellett’s car park to be considered. Dulux had a huge amount of applications from all over Ireland. 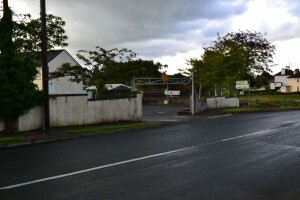 Thankfully Swinford was one of the 194 applications that was accepted. 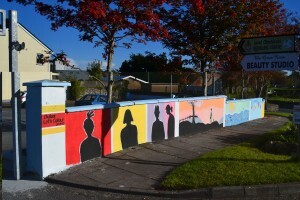 The project we had in mind was the car park wall at Davitt Place. Remember what it looked like? We had to send in photos and measurements of the proposed project to Dulux. Due to the huge amount of applications, ( 194 in total ) Dulux had a backlog of orders to process. 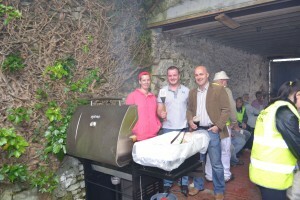 When we eventually received our order we got stuck into the project, which luckily we completed over two weekends. We were very lucky with the weather, which stayed pretty fine over both weekends. We were also very pleased with the amount of people that volunteered both weekends, we could not have completed the project without them. We have to say also a big thank you to our Artists who set out and stenciled the murals, Trease Hennigan, Gemma Feeney and Jennifer Fahey. We think you’ll agree, the job that both the Artists and Volunteers did is absolutely brilliant. It has really transformed the overall look of the car park! All of the car park wall, both inside and out was painted.